1. Login to the LMS and open your subject page and then click on the link for Readings Online. 2. 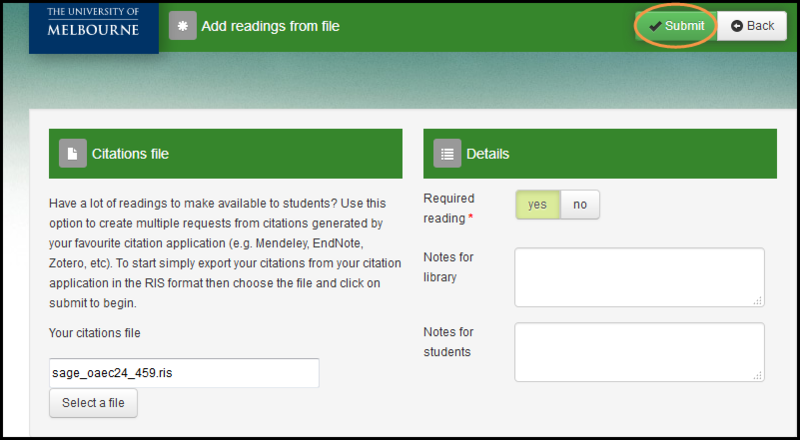 From the Readings Online page in the LMS subject, click on the Add drop down menu and click on the Readings from file option. 3. Click on ‘Select a file’ and navigate to the location where you saved the RIS file. This is usually your Downloads folder. Select the file – the default file name will be *.ris - then click Open. The file should now appear in the field. 4. Click Yes if a reading is required or No if it is not. Include any notes for students in For Students. Notes for the Readings Online team can be included in For Library. Then click Submit. A system generated email will be sent to you once the RIS file has been submitted. This email can be deleted once received. 5. On the Readings Online home page, click Refresh and the new reading will appear in the ‘Ungrouped readings’ section of the screen, with the book listed last. 6. Test the link to ensure that the link is directing users to the full-text content correctly by clicking on the globe icon. Depending on the database the chapter may only link to the abstract. You will need to ensure the link is directing students to the full text of the book. 7. Click on the book/chapter title to view the full citation and check that the citation is correct. 8. You may wish to organise the new ungrouped readings into groups. See the organising readings into content folder section in “Managing your reading list”.